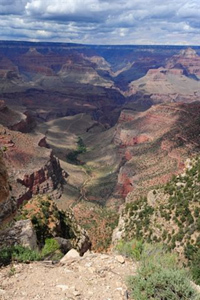 Home Other Articles Grand Canyon: How Big Is the Grand Canyon? Unsurpassed by any other natural wonder, the Grand Canyon of the Colorado River is the largest in the world. Angling some 277 miles across northwestern Arizona, this awesome gash is 18 miles wide in places and about 1 mile deep. The chasms began to take shape less than 10 million years ago, when gradual uplift of the region forced the Colorado River to increase its speed. Scouring its channel ever deeper into the bedrock, the rushing river probably carved only a narrow gorge at first. Weathering of the exposed rocks, periodic landslides, and other tools of erosion gradually widened the cleft and carved the canyon’s intricately sculpted rock formations. In recent years, a dam upstream from the canyon has reduced the river’s flow and, as a result, its power to erode. Even so, the canyon is still growing and changing. Waterborne debris continues to rasp away at the riverbed, and from time to time boulders topple from the canyon’s rim, slowly but surely altering its contours for all time.